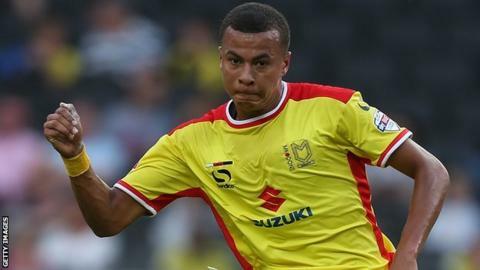 MK Dons boss Karl Robinson says that some of the Premier League's biggest clubs have enquired about midfielder Dele Alli. The 18-year-old was linked with a move to Liverpool in the summer. He received plaudits for his performance in the 4-0 victory over Manchester United in the Capital One Cup on Tuesday. "We've had two or three conversations with top Premier League teams," Robinson told BBC 5 live's Sportsweek. Alli marked his first senior start, as a 16-year-old, with a goal in an FA Cup replay at Cambridge City in November 2012. He has since found the target nine more times in a total of 51 appearances, including a goal in Saturday's 2-0 win over Crawley in League One. Robinson wants the England Under-18 international to remain at MK Dons in the meantime and earn more first-team experience. He added: "My advice is to stay until Christmas. If something happens then, perhaps we can get him back on loan until the end of the season, by which point he will have played 30 or 40 games this season. "He will then have the experience so that when he rolls up at a Premier League club he can compete for a first-team place."